When TULA first sent their products my way to try out, I was a tad bit skeptical. I've tried so many skincare products that do absolutely nothing special at all for my skin and are, quite honestly, a waste of money. While some of these products just worked "okay" for me, others amazed me...so I definitely thought it was worth sharing my thoughts. This cleanser with blueberry extract, turmeric and chicory root may seem like a gel at first sight, but it's actually a foaming cleanser which I noticed upon lather. I wasn't really super impressed with this particular cleanser and could probably switch it out with other formulas that I prefer more. It wasn't extremely drying, but I might not reach for it unless I run out of my faves. For my combination-oily skin and because I'm always wearing makeup, I would want to try the Kefir Replenishing Cleansing Oil out next time. If I did continue using this cleanser, I'd probably use it when I double cleanse at night -- Kefir Replenishing Cleansing Oil first, then Purifying Face Cleanser. Now y'all know I LOVE face masks and I was really excited to try the Exfoliating Treatment Mask with lactic acid and bentonite clay. For this formula, I received a small sample size, but I pretty much got the gist of it and a little bit goes a long way as you only need to apply a thin layer. The number one thing I love about this treatment mask is that it exfoliates while performing as a mask. I'm not the best at remembering to exfoliate; however, I never ever forget to mask -- it's one of my favorite beauty rituals! I believe in using a face mask at least two to three times per week and that's exactly how much we should be exfoliating. It's a total win-win. When I received these products, I couldn't figure out whether to use this or the Aqua Infusion Power Liquid first...but the Resurfacing Gel acts as a toner. I haven't had very much luck using toners/exfoliators with acids even with my skin of steel and I was reluctant to use it, but this one was very gentle. I've found that sometimes formulas can be way too harsh for my skin. The Resurfacing Gel is alcohol-free and combines 100% natural probiotics and glycolic acid to exfoliate minus dryness. It even has a hydrating effect with natural mushroom and beet extract which are said to be more hydrating that hyaluronic acid. *gasp* Contrary to what you may have heard, oily skin does need hydration, so don't shy away, Beauties! How It Works: Squeeze one to two pumps of the Resurfacing Gel to a cotton pad and apply to entire face. Let dry before moving on to apply serum. Serums are usually some of the best formulas in a skincare line because they have the most powerful and concentrated ingredients. This means that there are more nutrients and vitamins for your skin to drink up! The Aqua Infusion Power Liquid is a gel-like serum that feels super hydrating from the very first touch. I really liked using this serum especially at night and the overall health my skin each day was wonderful in appearance and texture. The serum uses one of my favorite skincare ingredients for improving texture, prickly pear, as well as hyaluronic acid and lactococcus ferment lysate probiotic. If you're going to switch up anything in your daily skincare routine and need hydration, I would recommend giving this one a try. Moisturizers seem to make my top favorites a lot when trying out a new skincare line. Between the Day & Night Cream and Gel Cream, I was so confused on which to use and when. I decided to use this one on most days in the morning and before bed. It contains rice nutripeptides, watermelon extract, retinol and Vitamin A. If you're really into skincare, retinol can be drying especially in serums where it's more likely to be stronger, so hydration is important. This cream gives your skin both a dose of retinol AND the hydration. I tried the Aqua Infusion Oil-Free Gel Cream before going out just last night and I was stunned at how well my skin reacted even with makeup on. 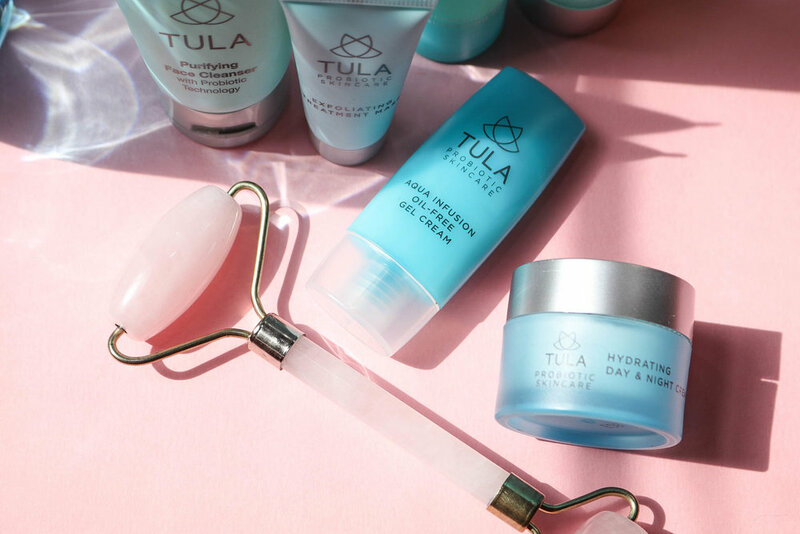 Even though the Hydration Day & Night Cream didn't leave my face feeling greasy and oily like a lot of moisturizers tend to, I think the Aqua Infusion Oil-Free Gel Cream just might be my absolute favorite out of everything TULA sent because...it's just a game-changer! I've tried countless face primers and setting sprays...and most of them keep the makeup in place, but don't prevent serious shine. It becomes a waste of money and it can get frustrating as hell. As a matter of fact, many moisturizers play nice with makeup...but this one takes the cake. Based on my experience, I would absolutely purchase it on my own to use as a moisturizing primer. The skin absorbs the hydration ,which is exactly what oily skin needs, and fights the oil. By the end of the night getting in after 1AM, my makeup was still in place and my skin was NOT shiny AT ALL. Usually it's an oil slick....but it had a natural, dewy glow and texture. I couldn't believe it. NEED this in the larger size ASAP. These products were received courtesy of TULA for review and editorial purposes; however, all thoughts and opinions are my own.